Prado, after 28 years, closes on Blvd. ; Vive Le Parisien! LARCHMONT restaurant closes at the end of November. Larchmont tenant activity is like the tides — some go out and some come in. Lately there are changes taking place near Beverly Boulevard and First Street. Plus, there was a good holiday party at the southern end last month! See the story about new men’s clothier, Buck Mason, on p. 25. Prado, 244 N. Larchmont Blvd., is closing at the end of November, the Chronicle learned. A loyal participant in the Taste of Larchmont, Prado Restaurant has been serving jerk chicken, fried plantains, black beans, Jamaican black pepper sauce, empanadas, enchiladas, paella, Louisiana crab cakes and other distinctive dishes to locals since 1990. 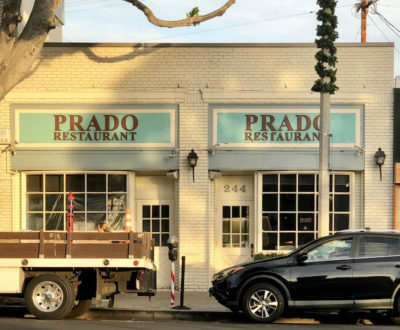 Javier Prado, the owner and chef at the Caribbean restaurant, said a French eatery headed by Sebastien Cornic of Culver City’s “Meet in Paris” will move into Prado’s location. When asked why his restaurant was closing, Prado noted that the profit margins have been thin, and with the last raise in rent, it was better to close now and concentrate on his catering business. In the meantime, Chef Prado is looking for a kitchen from which to base his catering business. Javier and his son, who run the restaurant together, will take it easy over the holidays, except for catering jobs they have in the works. As Prado moves out, Larchmont Village welcomes a new eatery onto the street — Café Parisien. Being launched by Sebastien Cornic, chef at bistro Meet in Paris in Culver City, Cornic says he envisions this new café to be much like a Parisian café. Shoppers can pick up a coffee and pastry at 6 a.m. or drop by for lunch or dinner with full table service and wine in the afternoons and evenings. When asked why Cornic chose Larchmont Village for his new endeavor, he said that what he liked about it was the village atmosphere, similar to that in Culver City. There is also a pedestrian flow, missing in Culver City, from which he believes his café will benefit. Cornic is originally from Montmartre in Paris’s 18th arrondissement, where his family had five restaurants. “My family has been in the restaurant business since as long as I can remember,” says Cornic. His father and mother began with a seafood restaurant, Charlot Roi des Coquillages, before opening four more restaurants. They are all closed now; Charlot closed the most recently so Cornic’s parents could move on to the next chapter of their lives. Cornic came to Los Angeles, and Larchmont, via a circuitous route, moving first to Canada, then later going to the Glion Institute of Higher Education in Montreux, Switzerland, for hospitality management school. His wife, Cecile, convinced him to move to the U.S., where they started out first in San Diego, before moving north to Los Angeles. Now with two-year-old twins, the restaurateur hopes that Café Parisien will do well and fill a unique spot along the boulevard. Cornic says he is shooting for a soft opening before Christmas, with a grand opening possibly in the week between Christmas and New Year’s. At the opposite end of the shopping street, DMH Aesthetics celebrated its eighth anniversary on Nov. 14. Stand-up tables filled the sidewalk in front of new neighbor Buck Mason, and a big In-N-Out truck was parked at the curb. Proceeds from the event were being donated to help a family rebuild after their home burned in the Camp Fire. We shall see what else the tides may bring in the new year.